How to Correct or Fix Out of Phase Cancellation in Recordings? Tags: Phase in digital audio. Ever wonder that your recordings during tracking sessions sound very weak when mixed together? The recording might be experiencing an out of phase or phase cancellation problems in audio recording. For those beginners, who simply find this very hard to understand, please take a look at the animated gif below for two mono waveforms (in gray) traveling in the same direction (this is analogous to your two mono signals traveling across the audio cables from microphone to audio interface and then finally to your digital audio workstation software). When they are in your digital audio workstation, these mono signals are summed up during your audio mixing process, the result of the addition of these two waveforms is the color blue below. 1.) If two traveling waves or audio signals are “in-phase” or in “timing” with each other. The resulting amplitude (the blue wave) of these two mono signals is maximum (strongest). 2.) 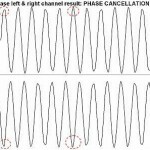 If two traveling waves starts to experience some “delay” with each other (they are not synchronized or timing anymore) the resulting amplitude starts to decrease. In actual audio mixing, the sum wave is not as strong as the original inputs. You might wonder why the resulting mix sounds very weak. There might be phase related issues. 3.) If two traveling waves are exactly 180 degrees out of phase with each other, the summation of these waves is actually zero and the result is a complete silence (as you can there is a section where the summation is simply a horizontal line). In practical audio mixing, phase issues can occur less than 180 degrees so you will still actually hear the results but it will sound weak and unnatural. If you have the symptoms outlined above, you should re-record your material and correct the phase issues. One of the most common causes in phase issues is delays in your recording. These are caused by microphone interference.